The Desenzano Del Garda is at the southern shore of Lake Garda and is the place that connects Lake Garda to other areas in Italy. The sulphurous springs here always attract those seeking miraculous cures. Places of interest include San Martino Della Battaglia, the site where Napolean III defeated the Austrians in 1859. The battle inspired the founding of the Red Cross. 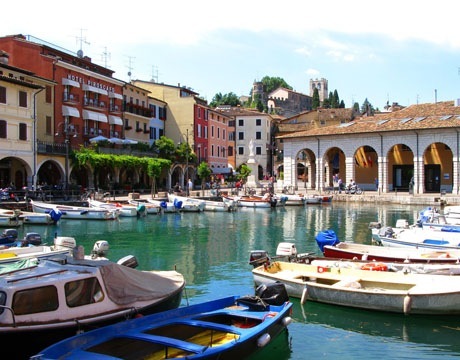 Desenzano is a lakeside resort as well as a bustling Italian community. As a destination location, Desenzano at Lake Garda is an excellent wedding choice. The social life is plentiful, as there is an abundance of cafes, restaurants and bars. The main shopping center is where the historical centre is located and the narrow streets that lead up to the medieval castle offer breathtaking views along the way. The area is pedestrian friendly and walking is part of the charm in this vicinity. The resort has a fantastic hydrofoil service, and all the main lakeside towns, including Garda, Limone, and Sirmione are easy to reach. Tuesday is a great day to be in Desenzano, as it is market day, and visitors can capture the true essence of this unique Italian town. Desenzano has two harbors and two public beaches. One harbor is large and modern and is the last stop for the lake steamers. The other harbor is older, yet more scenic, and it reaches clear into town. The Roman connection is substantial in Desenzano since the remains of a third-century AD Roman villa were discovered near one of the harbors. Within the findings, there were large multi-colored mosaics that have been enthusiastically sized-up against those at Pompei.